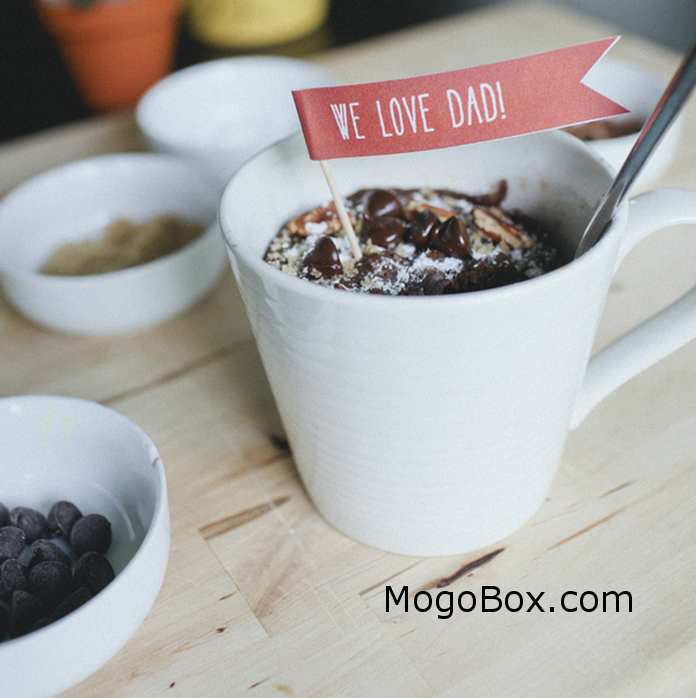 MogoBlog MogoLicious Tasty Tip of the Day: Father’s Day is in less than one week! This simple idea will allow your kids to help and is sure to win the way to any dad’s heart. Microwave mug cakes with bright printable gift tags are a great option for a gift the whole family can help to create. Treat dad or anyone you love to this easy mug cake. Make it in 2 minutes! Can’t beat that for a tasty and sweet treat. Combine all ingredients in a mug and stir. Add dash of salt and a dash of vanilla extract on top of the mixture in the mug. Add in dad’s favorite toppings – pecans, chocolate chips, brown sugar or sprinkles to make the cake special. This entry was posted in MogoBlog, MogoLicious and tagged Cake, Chocolate Chips, Cocoa Powder, Egg, Flour, Milk, Mug Cake, Oil, Salt, Sugar, Vanilla Extract.